Northwest Environmental Advocates has taken its case to court in an effort to obtain a new Washington state sewage-treatment standard under AKART — “All Known, Available and Reasonable Treatment.” For information about the case, refer to the NWEA news release and the lawsuit filed in Thurston County Superior Court. An environmental group, Northwest Environmental Advocates, is calling on the Washington Department of Ecology and Gov. Jay Inslee to invoke a 1945 law in hopes of forcing cities and counties to improve their sewage-treatment plants. Large ribbons of the plankton Noctiluca can be seen in this photo taken at Poverty Bay near Federal Way on June 28 last year. Excess nitrogen can stimulate plankton growth, leading to low-oxygen conditions. In a petition to Ecology, the group says the state agency should require cities and counties to upgrade their plants to “tertiary treatment” before the wastewater gets discharged into Puget Sound. Such advanced treatment would remove excess nitrogen along with some toxic chemicals that create problems for sea life, according to Nina Bell, executive director of NWEA, based in Portland. Most sewage-treatment plants in the region rely on “secondary treatment,” which removes most solids but does little to reduce nitrogen or toxic chemicals. Secondary treatment is an outdated process, Nina told me, adding that Ecology needs to lead the way to a more advanced treatment technology. “It’s a travesty that cities around Puget Sound continue to use 100-year-old sewage-treatment technology when cities across the nation have demonstrated that solutions are available and practical,” she said. According to Nina, state law requires the use of “all known, available and reasonable treatment,” or AKART for short. Secondary treatment is the current AKART standard of treatment, she said, but tertiary treatment is known, available and reasonable — and it should become the new AKART standard. The petition to Ecology (PDF 793 kb), filed in November, was denied earlier this month. Tertiary treatment is “neither affordable nor necessary for all wastewater treatment plants,” the Ecology director says in the letter, adding that Ecology’s approach is to set effluent limits for each discharger at levels that avoid water quality violations. A major effort, called the Puget Sound Nutrient Source Reduction Project is using a computer model to look at the effects of nitrogen releases from various sewage-treatment plants at current rates of loading and to consider what would happen if tertiary treatment were installed at specific problem locations. Meanwhile, future discharge permits issued by Ecology will consider nitrogen loading and require treatment plant operators to evaluate the effects of potential nitrogen-reduction targets, Maia noted. Preliminary studies showed that if nitrogen-removal equipment were installed at the five largest plants in Puget Sound, the population could double without increasing nitrogen loading. Installing the equipment at all treatment plants in Puget Sound could lead to a 40-percent reduction in nitrogen, according to information I reviewed for a series of stories last year in the Encyclopedia of Puget Sound. Taking the next step before considering a possible lawsuit, Northwest Environmental Advocates appealed to Gov. Inslee this week to overturn Ecology’s finding and support a requirement that all discharges to Puget Sound meet the higher level of treatment. Check out the appeal petition (PDF 217 kb). Noctiluca scintillans bloom at Saltwater State Park in Des Moines recorded June 4 of last year. 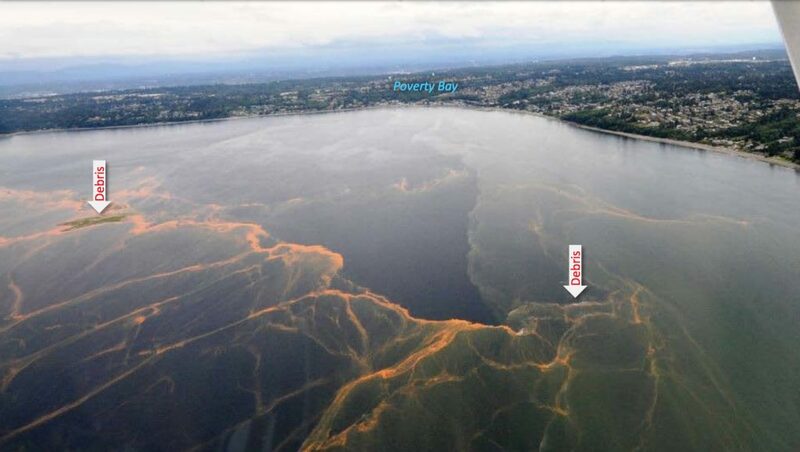 Tertiary treatment is being used in some areas of Puget Sound where excess nitrogen has produced massive plankton blooms, creating low-oxygen conditions that can be deadly to sea life. The Olympia region in South Puget Sound is one example. Check out my story in the Encyclopedia of Puget Sound. Excess nitrogen in Puget Sound can trigger massive plankton blooms, which can lead to deadly low-oxygen conditions for fish and other marine life. Other than sewage-treatment plants, sources of nitrogen include fertilizers from farm fields and septic systems in rural areas, as well as natural sources such as decomposing vegetation, nitrogen-releasing plants and salmon that have spawned and died. The greatest obstacle to upgrading all 87 sewage-treatment plants in Puget Sound is cost, according to local and state officials who peg the total costs of sewer upgrades in the billions of dollars. The largest sewage facility in Puget Sound is King County’s West Point plant in Seattle, which has no room to grow, according to county officials. To upgrade the plant to tertiary treatment would require that new equipment be installed elsewhere, with the sewage piped to the new plant. Nina Bell said if the state declared that tertiary treatment was “known, available and reasonable” under the AKART requirement, then individual treatment facilities could seek a variance for such hardships, or at least be given adequate time to design and install the equipment. When the U.S. Congress passed the Clean Water Act in 1972, secondary treatment became the requirement for most facilities across the country. New sewage-treatment plants were required in many areas. At first, the federal government offered grants of 90 percent for construction, leaving local governments to pick up the remaining 10 percent. Later, when those grants expired, Washington state launched its own program with 50 percent grants. Tertiary-treatment systems are designed to remove nitrogen, Nina said. But studies have shown that they can also remove some level of toxic chemicals, including medicines, personal-care products and other “contaminants of emerging concern” that currently go unregulated. She cited an Ecology study (PDF 9.7 mb), which showed that secondary treatment systems were able to reduce 21 percent of the 172 compounds tested to levels below reporting limits. But advanced nutrient-removal systems, such as tertiary treatment, were able to clean up 53 percent of the chemicals. Reducing those toxic compounds in Puget Sound would provide benefits for all species, including highly contaminated salmon and orcas, she said. The AKART standard, adopted as state policy in 1945, was envisioned to keep the waters of the state clean, Nina said. It only makes sense to use the latest technology in a reasonable way. At this point, she added, it would be better late than never.